Oh goodness. Vacation. All. That. Food. And junk. Lots and lots of junk food. Please tell me it's not just us. In our regular day-to-day lives, Sandy and I try to reasonably limit our unhealthyish indulgences to maybe a small portion a day. But on our recent vacation - game on. Chips, candies, cookies, pie, cheese curls, whatever else - oh yes. All that. And ice cream. Oh goodness. If you're ever in the area of Penn Yan, NY, you gotta go to The Spotted Duck. We went there regrettably only twice, including our last official trip stop, and I'd easily consider making the 10 hour round trip just to go there again, it's that awesome. 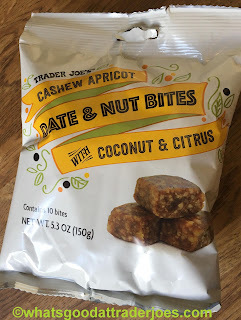 All this to say, I still got a case of the snackies now that I'm home, but I need something healthy to counterblanace all that...so it was great time to discover Trader Joe's Cashew Apricot Date & Nut Bites with Coconut & Citrus. You could tell me these bites were a Larabar test product and I'd believe you. There's that very similar vibe, with soft chewy dates making up the body of the bar with nuts densely interspersed. I've grown to enjoy that kinda texture from most Larabars, and it's much the same here. 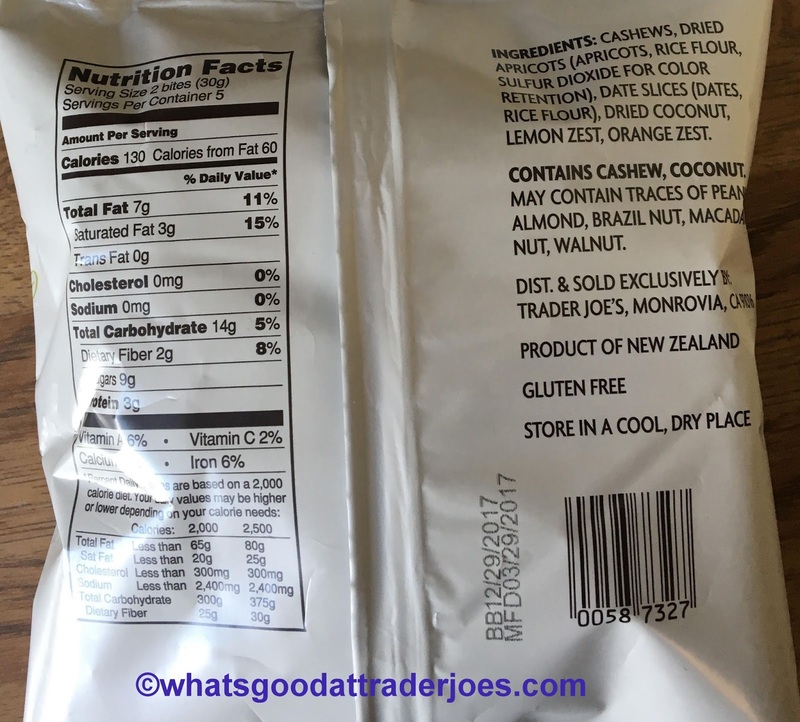 Cashews are a great nutty choice - so much better than either peanuts or almonds IMHO - and I like how the dried apricot adds fruity flair and natural sweetness. 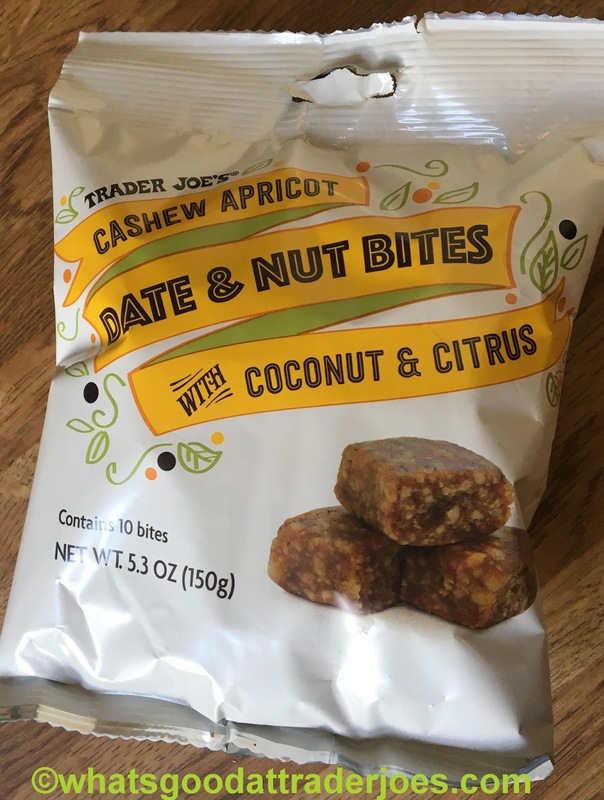 The zested citrus peel adds a bright, somewhat unexpected finish - a real nice touch that sets these apri-nut bites apart. Haven't mentioned the coconut yet. That's because while I'm not opposed to its presence, if I had to choose one ingredient to axe, that'd be it. There's so much else going on, the coconut just isn't terribly necessary, and the fibery specks do mess the texture up a small bit. Not awfully much, but enough to make note. And another small note: the packaging. The outer bag isn't the problem. It's what's inside. Each bite is individually wrapped in a sealed plastic wrapper that's almost big enough for two bites. That's just unnecessary. I get that TJ's wouldn't want the date bites to stick together, but there's goota be a better solution than that. So aside from a few small quibbles, we like them a bit. I'd consider them Paleo friendly as the only questionable ingredient is rice flour on the dried fruit...meh. Any way I look at it, the date and nut bites are a healthier bet than the half pound of Sour Patch watermelon chewies I gobbled on vacation. Or the quarter of a grape pie. Or the numerous scoops of ice cream. Or the...you get the point. Check 'em out for $3.99 for the sack. Yums. I love these!Have to disagree - it makes it much easier to grab a perfectly shaped bite as well as to share with the individual wrapping. I loved the fig and walnut version of these! I also like that they are individually wrapped- i actually liked to rip off little chunks and mixed it into a cup of plain greek yogurt for a really satisfying snack. And since they're wrapped it's easier to take on the go. I want to try the cocoa ones next! 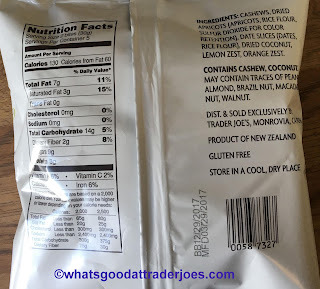 My Trader Joe's had zero on their space on the shelf and staff told me they do not have a date from the supplier as to when they can order to restock ��I was wondering if the company got overwhelmed? The blueberry/almond/peanut flavor with chia seeds, coconut, & sunflower seeds is fabulous! I'd love to try the cashew/apricot, too! My local TJ's was out of stock for either flavor the other day, hope the yummy Bites are back soon!! I love the individual wrapping as I use these for long bike rides and they fit in my bento box perfectly! A little prep to have the wrapper already open a bit and I don't have to stop to get nutrition in. I agree they are FANTASTIC. A little expensive. Also agree about the double up on packaging. They could be a bar instead. I tried the fig and cocoa ones and they tasted much sweeter and not as nice of a flavor overall. Just tried these for the first time today, and yes they are tasty, and yes I was shocked with all the packaging. It is not necessary to individually wrap each little bite, what a waste. More plastic to end up in our landfills and oceans. So maybe a few of them stick together in the bag, big deal, unstick them. If you're too lazy to separate your bites then you have issues. What? Do you want someone to come over to your house and place each bite in your mouth for you? Get rid of all this unnecessary plastic TJ's!